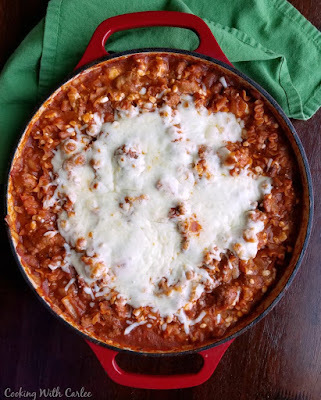 All of the flavors of lasagna cooked in one skillet on the stove. 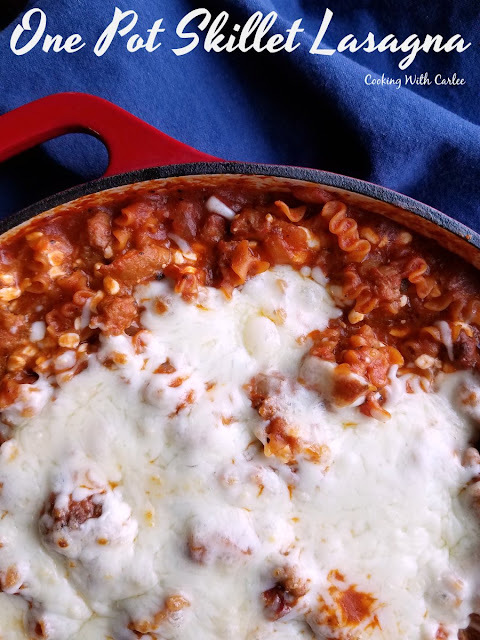 One pot skillet lasagna makes it possible to get it done on a weeknight and without a ton of dishes! If there's one thing I can almost guarantee is going to be a hit at our house, it's anything lasagna inspired. Or tacos. But mostly the lasagna thing! There is just something about the flavors and textures of lasagna that make us so happy. Then there's the melty cheese. We are all suckers for cheese around here! The only problem is lasagna takes so long to make. Even if you don't boil the noodles, there's still a fair number of steps to make it happen. By the time you get the meat browned amd the laters made the effort has you hungy to dig in, but you still have to throw it in the oven and let it bake to perfection. It's totally worth the effort, but not exactly an easy weeknight meal. So what do you do when you come home from work on a Wednesday night craving lasagna? You improvise, of course! We have been loving experimenting with one pot meals. The one pot taco pasta was a hit and so is the bbq pulled pork and rice skillet. So I just knew I could get our favorite flavors put together in a quick and easy one pot dinner. I made our yummy dinner in my favorite 3 quart braiser and it almost didn't hold all of the goodness. I'd definitely grab a dutch oven next time that way there's plenty of room in case anything else decided to leap into the pot. Hey, you never know what might happen in my kitchen. I'm sort of known for throwing in a little of this and that or adding whatever bits and pieces I have laying around. But really, this doesn't need anything else. With all of the sausage, sauce, cheese and pasta it is a lasagna lover's dream come true. If you are in the mood for layers of lasagna goodness, but want a fun change in pace, you should try our creamy buffalo chicken lasagna too! What are your favorite lasagna inspired recipes? In a large skillet or dutch oven, brown the Italian sausage. Drain off most of the grease and then add the onion and cook until translucent and softened. Stir in the garlic and oregano. Then add the pasta sauce, water or stock and pasta. Stir to combine. Bring to a boil and then drop to a simmer and cook covered for about 20 minutes. Be sure to stir the mixture occasionally to help the pasta cook evenly. Add a little more liquid if needed and cook until the pasta is done to your liking. Stir in the cottage cheese and top with mozzarella. Cover and cook until cheese is melted, then serve. When I was pregnant with my first child I came up with a tuna lasagna that we really enjoyed. I haven’t thought of it for years but it was a favorite of ours. I vaguely remember that. You will have to share the recipe here sometime! Love the size of the mafalada pasta!!! I know what is getting made this week!! Love a hearty skillet meal!! And I know this will be great leftover!! Only leftovers when the boys are at college, lol!! Have a GREAT Monday! Isn't it perfect for something like this? 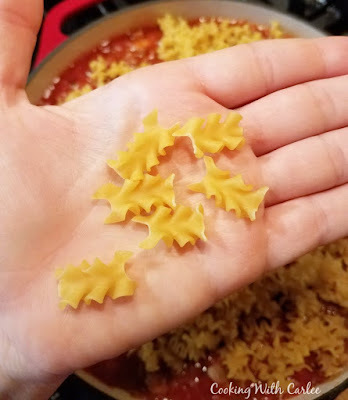 It reminded me of tiny lasagna noodles which is what gave me this idea! Right now we usually have enough left for a lunch or two, but I am sure when Little Dude hits high school a dinner like this will be gone in one night! This looks so yummy Carlee! I never make lasagna becuase it is so time consuming this is the perfect solution! Thank you! This takes so much of the time and effort out of it! I love this recipe and i'd love to try is sometime!! Thank you Julie! I hope you try it and enjoy it! I am trying this for sure! I absolutely love lasagna, but I just don’t make it. My husband was the lasagna maker in the house, so I just let him do it. I tried making it only once in my entire life, and that was when I was straight out of college. I guess my sauce wasn’t thick enough, because I went to serve it, and the whole piece slid right off of the spatula and onto the floor, noodles in one direction, meat filling in another. I never tried it again after that. This is right up my alley, looks delicious, and I would like to have some tonight! I am sure you could make a fine lasagna now if you put your mind to it, but it's so much easier to not have to fuss with all of the layers! ;-) I hope you enjoy this much easier version! Hi Carlee, I do like the tastes and texture of a nice cheesy lasagna, but like you said it does take a lot of faffing and isn't the quickest of meals to knock up. Your recipe sounds like a good quick fix. I agree, lasagna is one of our favorite dishes too. 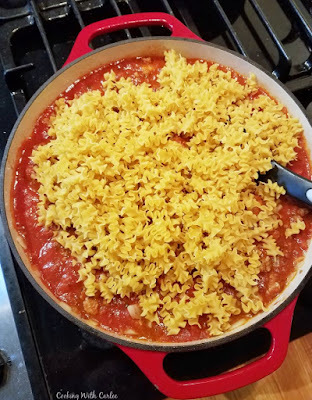 I love that this recipe is in one pot, that makes it really easy and I love the clean up, as well. It does make the assembly and cleanup so much easier! 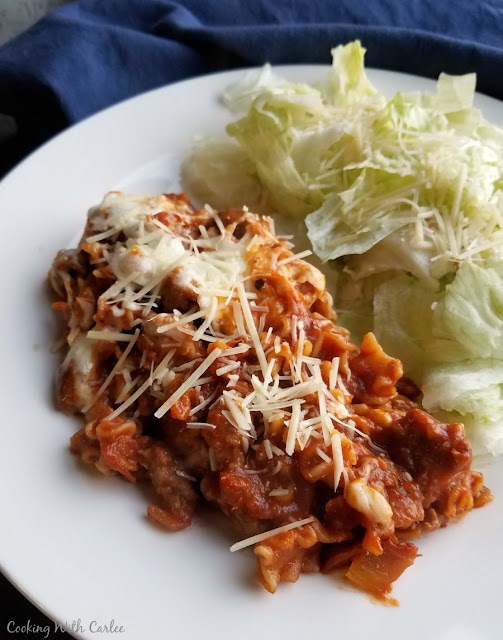 Your Skillet Lasagna looks fantastic! Hope you are having a great weekend and thanks so much for sharing your with us at Full Plate Thursday! Sounds scrumptious with the Italian sausage! I used sweet Italian sausage in spaghetti recently and my fellas are still talking about it. Pinning this. So glad you share with us at Merry Monday. We love your creativity. I've got this printed out and ready to try next week. Can't wait!